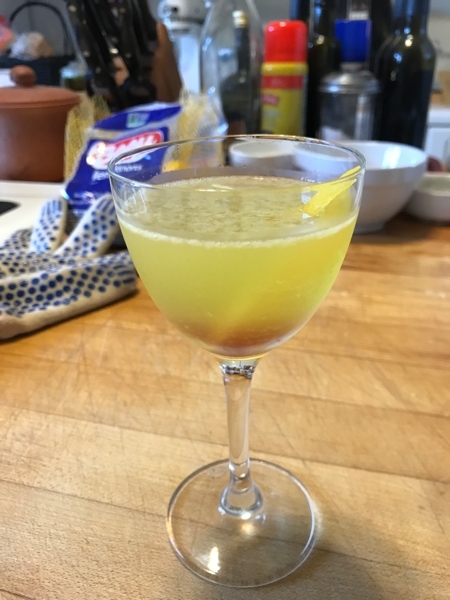 The other night I craved a sweet, dessert kind of cocktail, and for some reason this cocktail invented itself. Stir with ice, strain into a coupe. 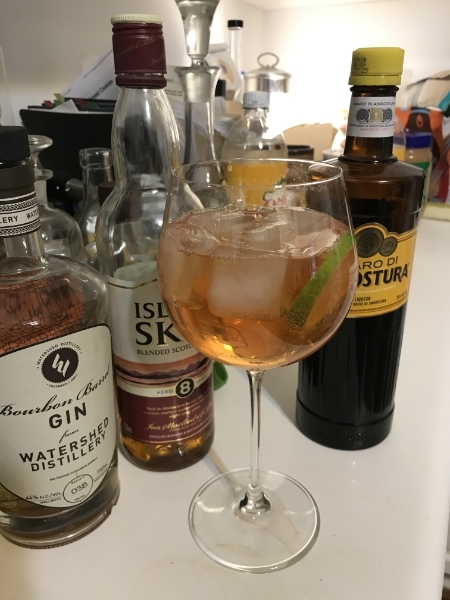 No garnish, no bitters. It’s sweet but not cloying, with a nice layering of the vanilla, chocolate, and nuttiness. Take one or two vanilla beans and split them down the middle. Plunk them into a bottle of vodka and let sit for 7–10 days, testing after one week. Remove the beans. You can strain the seeds out through a coffee filter, but you can leave them in as well. Shake with ice, pour into cocktail glass, garnish with lemon peel. There are multiple versions of this recipe online. This is the one I’ve settled on, but you can do all lemons, or any variety of orange instead of grapefruit. Peel the grapefruit and the lemon. Place the peels in a medium bowl; add the sugar. Muddle the peels with the sugar about a minute. Leave for 4–6 hours. The oils from the peels will puddle at the bottom of the bowl. Add the lemon juice and stir to dissolve all the sugar. Strain into a container. Refrigerate and enjoy! 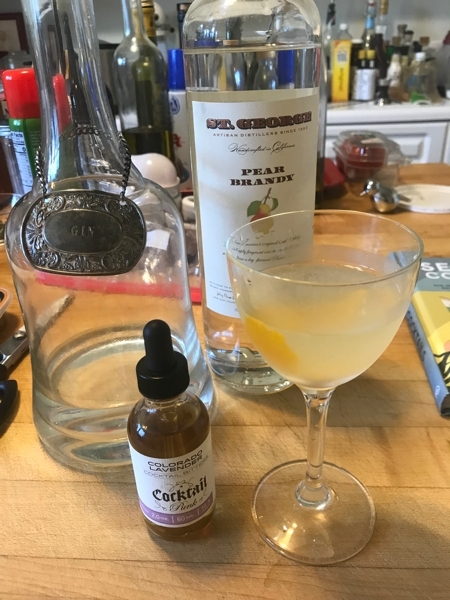 This one sprang from a desire to use my new bitters from Amor Y Amargo bar in NYC, specifically the Colorado Lavender bitters from Cocktailpunk. Also, I had bought a while back a bottle of St. George Pear Brandy. I should have known better, but hope springs eternal and St. George is usually not wrong. 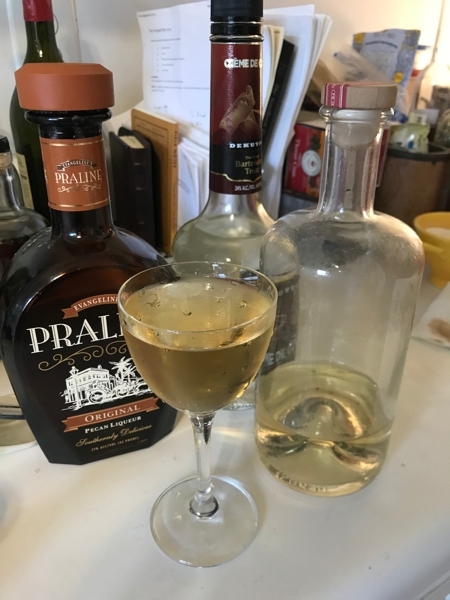 The problem with pear brandy is that the flavor overwhelms anything you put it in; nearly ten years ago we were in Key West and during a rainstorm took shelter in an outdoor bar, where a young man who had fled investment banking for the island life struggled with us to make a cromulent cocktail using the stuff. He failed, and I haven’t succeeded myself. Shake the first four ingredients with ice; strain into a coupe. Dribble the bitters on top. Garnish with a lemon twist. I go back and forth as to whether it’s cromulent or not, but others have told me it’s interesting enough. I may try again tonight with maybe 1/3 or 1/4 oz simple syrup. 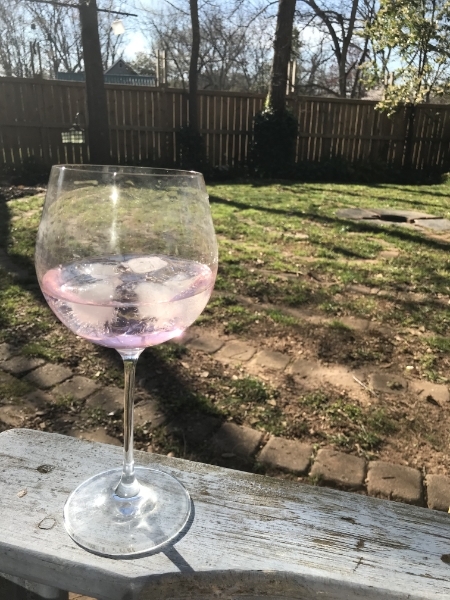 You will recall that I made gin a couple of weeks ago. It wasn’t horrible, as the label proudly proclaims, but I wanted to see if I could make a more nuanced version. 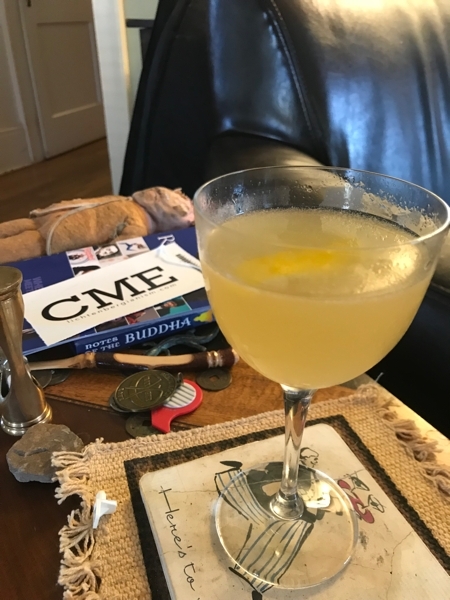 To that end, I took one of my new, handy-dandy Field Notes Brand “Dime Novel” editions and began taking meticulous notes—as opposed to just dumping stuff into vodka like I did last time. With that strategy, I think I was more successful. I now have a recipe that I can reuse if I decide this is a good one. Mostly, it is a good one. Whereas the first one was almost overpowered by the lovage and had a huge bitter finish, this one is more herbal and has an interesting wood note as a finish. That would be because as I finished up steeping the botanicals (gentian, angelica, lemon zest, lovage, coriander, burdock, and star anise), I rediscovered a jar of what I think is tincture of cedar chips. I boldly added 30 ml of that to the mix, and lo! it makes a lovely difference. 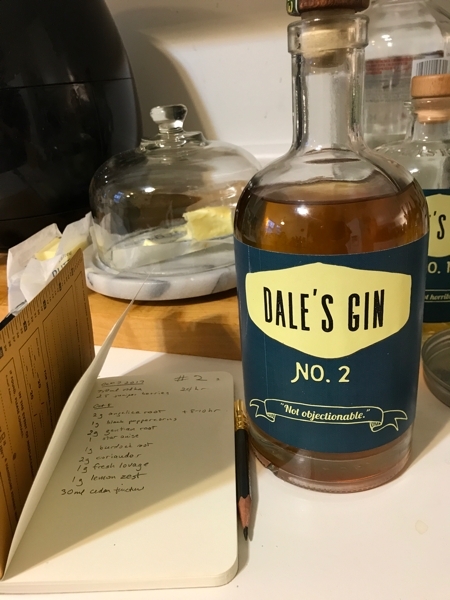 So here’s Dale’s Gin No. 2. Not objectionable at all. I made vanilla vodka a while back and promptly stuck it in the hall closet and forgot about it. I rediscovered it over the weekend and it’s been sitting out on the counter bugging me. Consider this an abortive attempt. Shake everything except the grenadine with ice. Pour, then pour the grenadine in; let it sink. It’s not bad, but it’s not very distinctive. Or it may be that I’m not into citrus juice cocktails these days. More work is required. 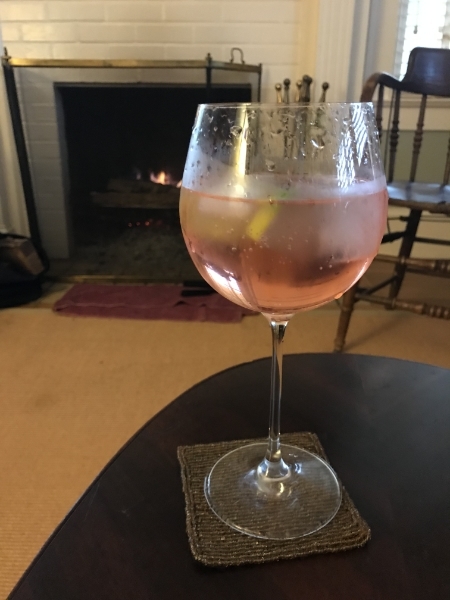 Also, I’ve made a second gin. I need to blog about it. 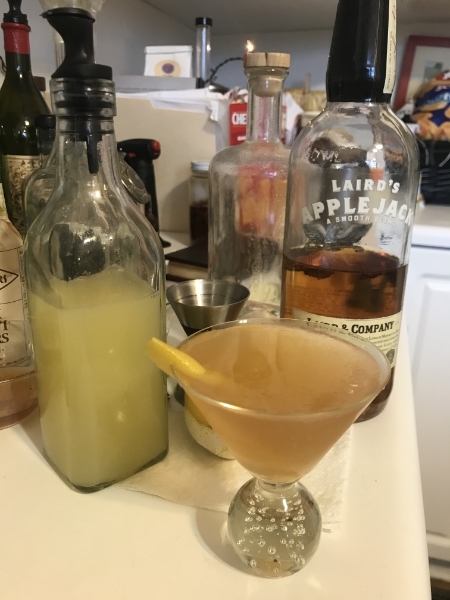 UPDATE: The cocktail is growing on me. The other night I was privileged to drop in to Barnes & Noble to a book signing by a former student, Blue Cole. Blue, who is actually the son of a high school classmate, was one of those charming, good-looking teenagers who you feared might amount to nothing. Dimples and blue eyes will only get you so far, after all. However, Blue has grown up to be a fine upstanding citizen who is only a little worrisome when his wife takes him to big box stores and leaves him unattended. This novel, Evil Upriver, is Blue’s third, unless I’ve lost count. But Dale, I hear you musing, supernatural horror is not your thing. You even write about it in the chapter on AUDIENCE in your own upcoming book, Lichtenbergianism: procrastination as a creative strategy. Indeed it is not, but 1) I go to book signings for all former students; and 2) Blue personally invited me to come and asked me to wear my pearl earring, since that’s what the bartender named Lyles in the book wears. How could I not invent a cocktail and take him a small box with said cocktail and other mini-bar accoutrements? 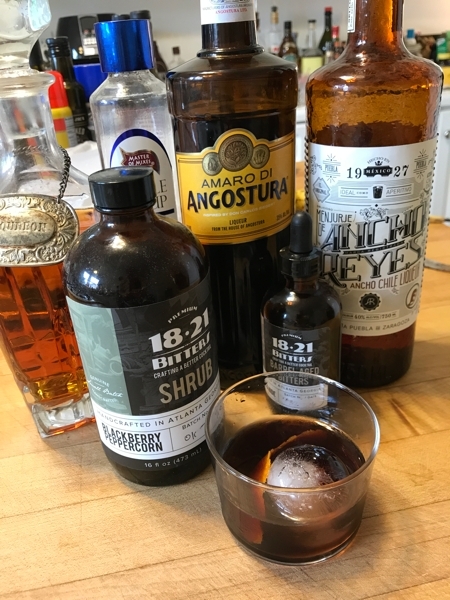 Actually, I was going to bring him the Smoky Topaz, which should be good enough for any normal purpose, but then my Lovely First Wife suggested that I invent a cocktail called The Afterlife because reasons. The idea was that it would be at first taste an interesting take on the Manhattan with a somewhat toasty finish (GET IT, KENNETH? ), but however, and also too, I felt it was lacking. Stir with ice, strain, serve on the rocks with an orange peel. Rather more ingredients than I normally prefer, but it’s tasty. Quite tasty.